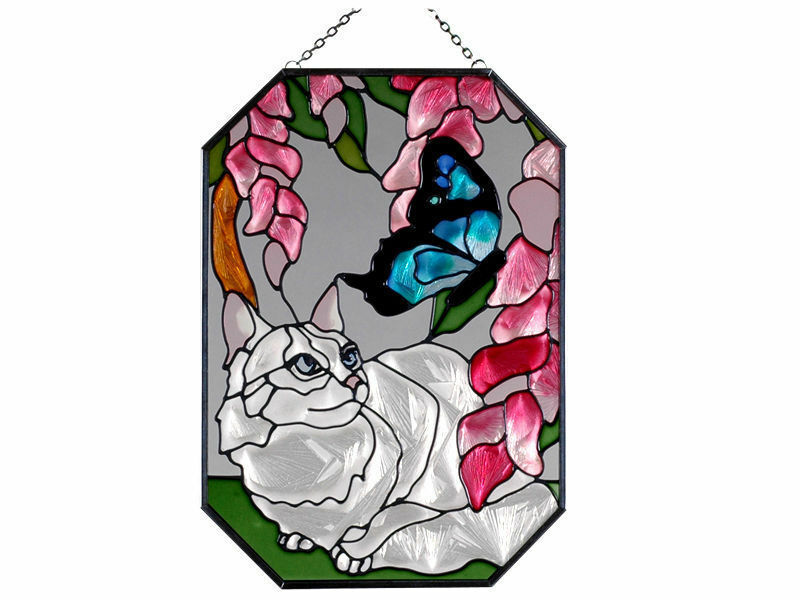 "Stained Art Glass WHITE CAT Suncatcher" You can almost feel the softness of this kitty's fur coat in this brilliantly rendered study of a cat and a butterfly! Zinc-framed, this hand-painted art glass panel features a pre-attached chain loop in attractive silver tone, and is ready-to-hang in any sunny window. The metal frame measures 7" wide x 10" high. "Stained Glass WHITE CAT Suncatcher" You can almost feel the softness of this kitty's fur coat in this brilliantly rendered study of a cat and a butterfly! This hand-painted zinc-framed art glass panel features a pre-attached chain loop in attractive silver tone, and is ready-to-hang in any sunny window. The metal frame measures 7" wide x 10" high. PLEASE NOTE: Shipping ONLY within the continental U.S. Hawaii, Alaska, and Puerto Rico residents please contact seller for shipping quote before ordering.